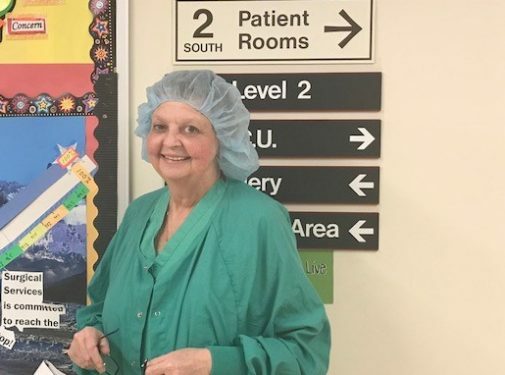 While compassion is part of her job description, Barbara Pohrte’s recent personal triumph over an aggressive form of cancer is the muse behind this Advocate Nurse’s extra efforts to empower, serve and thrive through patient care. Barbara works in the Surgical Unit at Advocate Trinity Hospital in Chicago, where she preps patients for surgery and updates family members during the procedure. Every day, after she finishes her regular responsibilities, Barbara goes off-the-clock and makes personal calls to her former patients –or “new friends”, as she likes to call them– who received port-a-catheters in the previous days and weeks. Barbara educates patients about port-a-catheters, using her own recently-inserted port as a visual aid. A port-a-cath is a device implanted under the skin to give access to a patient’s venous system. Once implanted, intravenous medication can be administered without additional needle sticks. Many patients are surprised to learn (and see) that Barbara has a port implanted near her collar bone. And once patients hear this, they open up and ask questions. Many ask Barbara to follow up by phone and check on them after their hospital discharge – before she has a chance to offer. “I tell them, ‘You’re going to be a member of my club,’ and ‘You’re going to forget that it’s there, but when you’re going through chemo [infusions], you’re going to love this port,’” Barbara says. About a year ago, Barbara started having trouble with her eyes. Soon after being diagnosed with dry eyes, Barbara noticed a lump in her left eye. Two months later, the lump had grown toward the middle of her nose. After a subsequent trip to her doctor, Barbara discovered she had an aggressive form of non-Hodgkin’s lymphoma. Her treatment started immediately, and included implanting a port-a-cath to make chemotherapy infusions easier. Barbara completed a 6-month chemotherapy regimen, and as of Feb. 28, 2018, she is cancer free. Now, she uses her port to deliver her very personal level of care to surgery patients. She believes that arming patients with knowledge, a bit of inspiration before surgery and lasting personal connections built on shared experiences are what her patients need to overcome their illnesses. “It’s not that I’m a nurse. I’m a patient, and I’ve gone through what they’re going through. We sit and talk like friends. That’s our common bond. I can relate,” Barbara explains.